Fish are being grown in giant cages, nets, and ponds with the use of pesticides, hormones, and antibiotics, all of which can result in significant water pollution. 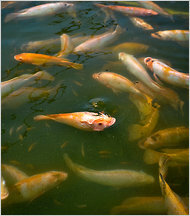 Pollution also results from fish wastes and excessive food that goes into the water. Escaping factory-farmed fish can also create dangerous genetic contamination. Unfortunately, industrialized aquaculture facilities are replacing natural methods of fishing. Just as multinational corporations have forever changed the way food is grown on land to the detriment of public health, the environment, local communities and food quality itself, they are poised to do the same at sea. The identical factory-farm model is being adopted for aquaculture: growing food as cheaply as possible using toxic chemicals and other harmful techniques, packaging it in enormous bulk, and shipping it to distant grocery stores and restaurants all around the world. More about factory farmed fish from the New York Times.